Everyone in our home enjoys these cookies! Add eggs one at a time, then the vanilla. Add the dry ingredients and mix together. You need to scrape the bottom of the bowl to be sure all ingredients get mixed together. Using a 2-inch round cutter cut the dough into circles. You can reroll the scraps. Place the cookies about 2 inches apart on ungreased baking sheet or line with parchment paper. I line with parchment. Bake the cookies for about 20 minutes. They should be slightly darker around the edges. Meanwhile, prepare the filling; using a mixer, cream the butter and shortening until fluffy. Beat in the confectioners’ sugar and vanilla. Whoa. That’s a long name. I saw these in June’s Food Network Magazine. I just can’t resist a lemon recipe, especially lemon cookies. I may be watching what I eat but I can still have a cookie once in awhile. Hmmm, maybe two. These are simple and deeeelicious! Preheat oven 350 degrees. Line 2 baking sheets with parchment paper. Whisk flour, baking soda, cream of tartar and salt in medium bowl. Set aside. Beat butter, sugar and lemon zest on medium-high speed until light and fluffy, about 3 minutes. Beat in eggs, lemon juice and extract. Reduce to low and add flour mixture until combined. Add white chocolate chips and mix together until combined. Drop heaping tablespoonfuls of dough about 2 inches apart on baking sheet. Bake for 4 minutes, turn baking sheet around, bake 4 minutes. Remove from oven, let cool and EAT! Whisk the flour, baking powder and salt in medium bowl, set aside. Beat the eggs in stand up mixer (or large bowl with electric mixer) on medium speed until foamy, about 2-3 minutes. Medium speed, add sugar and beat until thick and pale yellow, about 5 minutes. Medium speed, gradually add the melted chocolate mixture and beat until combined, about 1 minute. Reduce speed to low. Add flour mixture, beat until combined, about 1 minute. Fold in chips and hazelnuts. Line 2 baking sheets with parchment paper. Drop heaping tablespoons of batter 2 inches apart on the baking sheets. Bake until the cookies are slightly puffed and crackly, 12- 15 minutes. Let cool 5 minutes on baking sheets, then transfer to a rack to cool completely. These are really delicious especially after they cool. Enjoy! Martin has been bugging me to make Chocolate Croissants. If you checked into making croissants you would know it is a 3 day ordeal to make these baked goods. I am sure I will do these someday but not quite yet. Maybe in the dead of winter. These cookies were super simple and very delicious. I don’t think he shared these cookies with anyone! No one!! Directions1. Whisk flour and salt together in bowl. 2. Using stand mixer fitted with paddle, beat butter, cream cheese, and granulated sugar on medium-high speed until light and fluffy, about 3 minutes. 3. Add vanilla and beat until incorporated. Reduce speed to low and add flour mixture in 2 additions, until just combined, scraping down bowl as needed. 5.Adjust oven racks to upper-middle and lower-middle positions and heat oven to 350 degrees. Line 2 baking sheets with parchment paper. 7.Roll dough into 20 by 8-inch rectangle on lightly floured counter. Cut dough into twenty 4 by 2-inch rectangles. Working with 1 dough rectangle at a time, place 1 chocolate piece crosswise across dough so chocolate overhangs edges. Fold dough around chocolate. Repeat with remaining 19 pieces of dough and chocolate and place cookies seam side down, 1 1/2 inches apart, on prepared sheets (10 per sheet). Brush tops with egg and sprinkle with sugar. 8. Bake until golden brown, 18 to 20 minutes, switching and rotating sheets halfway through baking. Let cookies cool on sheets for 5 minutes, then transfer to wire rack and let cool completely. 9. Break remaining 1 chocolate bar into pieces and microwave in bowl at 50 percent power, stirring occasionally, until melted, about 1 minute. Using spoon, drizzle chocolate over tops of cookies. Let set for at least 30 minutes before serving. Too lazy to make Fruit and Nut bars. Found this recipe at Penzey’s and thought I would give it a try. These are simple to make and very flavorful. Place oatmeal in the food processor or blender and pulse into fine crumbs. Add chopped raisins, dried fruit and nuts to oatmeal in processor. Pulse until nuts break up. Set aside. In a mixing bowl cream together the sugars and butter until fluffy. (I used my stand up mixer). Add egg, water (or juice), vanilla, salt, cinnamon, cloves, baking soda and flour – mix well. Fold in the oatmeal/fruit/nut mixture. Let sit for 15 minutes for the oatmeal to absorb the liquid. If the batter becomes too stiff add 1-2 Tablespoons of liquid (this did not happen to me). Drop the batter by the Tablespoon onto parchment lined cookie sheets (or greased per Penzey’s recipe. I haven’t greased a cookie sheet in years.) Flatten slightly. I ended up freezing half the batch. They hold up very well in freezer. If I left them all out they would be eaten up….by ME! Simple and Delicious!! I originally made these in January 2014. Here is an update in January 2016. I tried dipping some in chocolate this time. When I made these in 2014 my mom requested these cookies. Eric and Martin are fans of coconut. This recipe made 30 cookies. I made 3 different types; plain macaroon, macaroon filled with raspberry or strawberry jam and almond flavored macaroon. 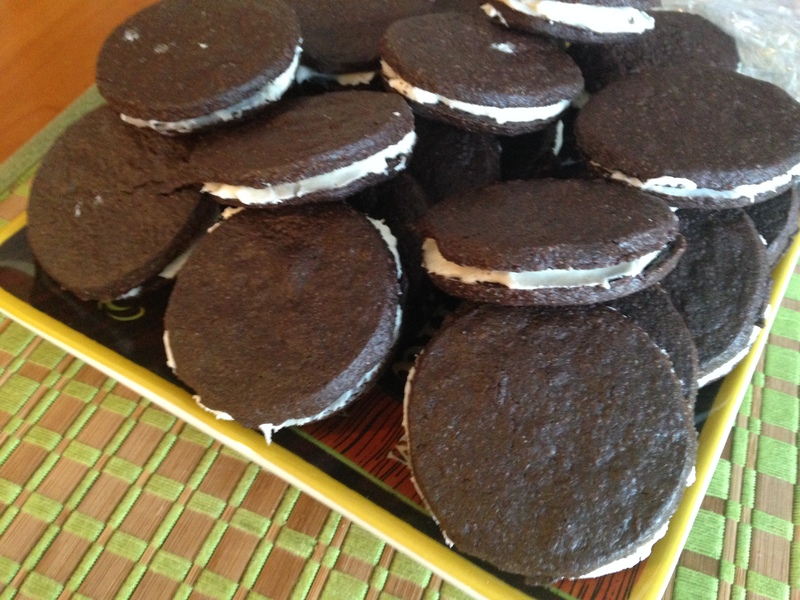 This was an incredibly simple recipe and these cookies were flavorful, chewy and delicious! 2. 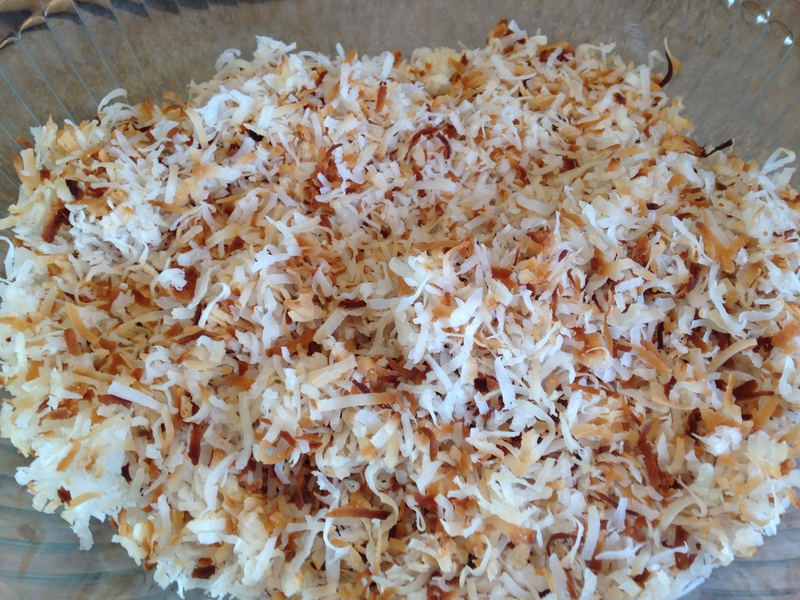 Spread coconut evenly across 2 parchment lined baking sheets. Toast until golden brown, 15 minutes. Stir every 5 minutes. You need to stir the coconut so it toasts evenly. 4. Combine toasted coconut, condensed milk and vanilla in a bowl. 5. Fold egg whites into coconut mixture. Blend well together. 6. Wet hand, to help keep mixture from sticking, and form into about 30 mounds. Golf ball size or smaller. Place on parchment lined baking sheets. 8. To make almond flavored add 1/2 teaspoon almond extract and topped with a slivered almond. 9. You can also dip in chocolate when you take out of oven. I melted 1 cup bittersweet chocolate in microwave for 45 seconds. 10. Bake until browned and crisp edged, about 12-15 minutes. I turned baking sheet around after 6 minutes. Let cool on rack. Everyone loved these simple and delicious cookies! Enjoy!! For those who are unfamiliar with the term Puppy Chow it is also called Muddy Buddies. You know, the Chex cereal munchie recipes. I saw this recipe and thought of my friend, Jenni. Had to make these cookies for her. When I first tried them I thought they were tasty. However, they were even better the next day! Cream butter and peanut butter together until smooth. (I used my stand up mixer) Add both sugars and mix on medium. Add egg and vanilla until all combined. Add flour, baking soda and salt. Mix on low speed. Roll into a ball about an inch round and place on baking sheet. Lightly flatten. Bake for 8-9 minutes until lightly browned around the edges. In a 1-quart microwavable bowl, microwave chocolate chips, peanut butter and butter uncovered on High 1 minute; stir. Microwave about 30 seconds longer or until mixture can be stirred smooth. Place back on cooling rack until chocolate is set. Got it all done in less than an hour. I would say “Simple and Delicious”. Enjoy! !